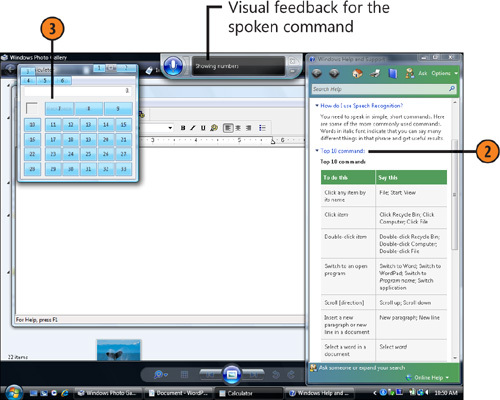 Windows Vista includes a powerful speech-recognition program that makes it possible for you to use your voice to command the computer. Although speech recognition is designed primarily for people who have difficulty using the keyboard and/or the mouse, the ability to direct Windows and your other programs with your voice has a certain authoritative appeal. And, as with the mouse or the keyboard, there are numerous ways to accomplish any specific task. 2. Use the commands that you learned in the tutorial or from Help. If you can’t remember a command, say “What can I say?” to display Windows Help And Support, which lists all the commands you can use. Start a program “Start,” and then the name of the program. Open a menu in a program or window The name of the menu. Activate a toolbar button The name of the button. Activate a link The name of the link. Click an item “Click,” and then the name of the item. Use the equivalent of keystrokes “Press,” and then the name of the key or the name of the keyboard shortcut. Switch to a program “Switch to,” and then the name of the program. Scroll a specific number of lines “Scroll,” and then the number of lines. You must go through a full setup process prior to using the speech-recognition program for the first time, including setting up your microphone and stepping through a tutorial that teaches you the basics of using speech recognition. Don’t skip the tutorial! As you work your way through it, the speech-recognition program is learning to understand your voice and the way you pronounce words. If you skip the tutorial, the speech-recognition program won’t be very effective. 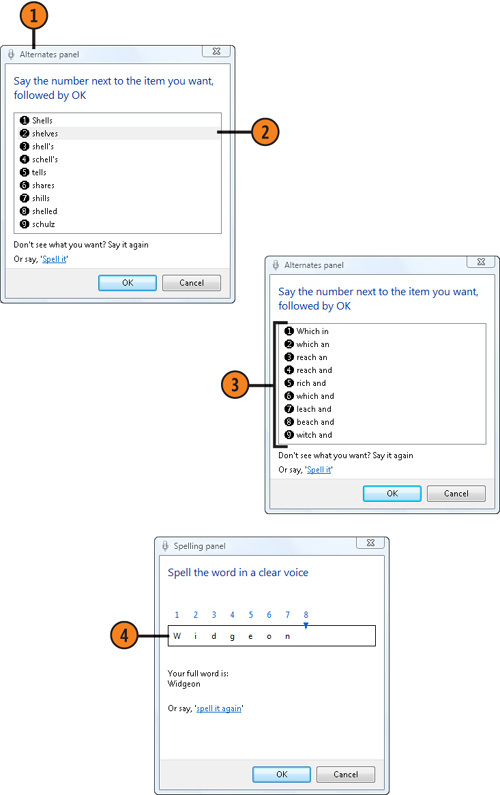 The speech-recognition program lets you issue commands to your computer and dictate text in a document. Of course, while you’re dictating, you’ll also be issuing some commands—for example, telling the computer to correct or change some words, to start paragraphs, and to scroll through the document. Fortunately, the speech-recognition program is usually smart enough to know when you’re dictating text and when you’re issuing commands. Even if the speech-recognition program gets something wrong, however, you can easily correct it. 1. In a document that accepts text, start dictating your text. If the speech-recognition program is sleeping, say “Start listening” before you start dictating. Insert a punctuation mark The name of the mark—“Period, comma, question mark,” and so on. Insert a number The name of the number. Insert special characters The name of the character—“Double quote, open parenthesis, close parenthesis, hyphen, ampersand,” and so on. Insert an unusual name or word Spell the word one letter at a time. Move the insertion point around in a document The type of move—“End, backspace, move down two lines,” and so on. Figure out how to enter or edit something if you can’t remember the command “What can I say?” and then review the Help file. 1. Say “Correct” and then the word or phrase that needs to be corrected to display the Alternates Panel. 5. If the Add Word To Dictionary dialog box appears, specify whether you want to add the word to the dictionary used to identify spoken words, or whether you want to insert the word just this time. Dictating text can be quite frustrating when you first start, but, as you use the program, both you and the program get better. Also, for better recognition, you can do some additional speech training.